We have a great deal of personal debt in this country. Something that happened less when I was young as there weren’t credit cards, and loans were hard to come by. Our parents had come through the war and rationing so there was a strong message that one should budget and only buy those things that one could pay for. Writing a cheque made it easier to calculate what was left in one’s account but few people write cheques these days and keeping track of what’s in the bank is much harder when you use a debit card. What with compound interest, interest-only mortgages and working out the meagre interest on savings, it’s all so much more complicated now! We need help. Being in debt is miserable. Getting out of it is tough. Personally, I found the books and programmes of Alvin Hall helped me think about where my seemingly small daily expenditures were adding up and draining my ability to save. I suspect many of us would benefit from reading his book You and Your Money. You may have heard reports during the recent cold spell of how surprised people were that quite a large number of homeless refused the offer of a warm refuge. It was too big a jump of trust and habit. They know what to expect on the streets, however uncomfortable. And they have often built up a solidarity of social life with others in similar situations. Learning to socialise in new groups after being institutionalised or on the street is a major challenge. Helping the homeless make the journey back to work and a life within four walls is more complex than it might sound and is a step-by-step process. When I was running Positiveworks we were involved in a project with Business in the Community to help coach homeless women into the workplace. It was through this work that I became aware of how difficult these women found even small decisions, such as working out when to leave in order to get to a job interview on time. Maintaining the daily disciplines of time-keeping and planning was challenging for them. They had lost the capacity to keep on top of things and could easily become overwhelmed by the number of things they had to think about. We helped them to take a step back and consider the small steps they needed to take each day to gain employment and then to keep the job. Each achievement built their confidence but it did not happen overnight. Managing to return to the challenges of everyday life often took several months. 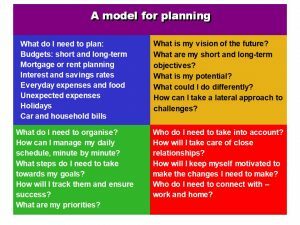 Just as parents move children from dependency to independence, we can often rather assume that the life skills of planning and decision-making are integral to humans but I found that when I used to coach teenage and adult students in revision-planning, few had been given any formal development in planning time, exams, or thinking about a future life or career. These skills have to be developed, honed and practised. As does financial prowess. When I was managing company and personal accounts I realised, too, how easy it is to depend on one’s partner, business or personal, to manage money. But then, aged 42, I read Smart Women Finish Rich, full of stories of women who had relied on others – often to their detriment! It taught me that one must always take responsibility for one’s own financial position, even should one’s partner be an accountant! It also helped me ratchet up my core beliefs about how much money I could make in business and how to plan for retirement. Invaluable. But the people who really need help are those whose lives have been disciplined by other people – teenagers growing into adulthood, those who have been in prison, in hospital, mental hospital, on benefits, or in the services. When your everyday activities, including meal times, are organised by other people the part of your brain that does the planning deteriorates – and surprisingly quickly! I have found that the four-quadrant template below, created from the Herrmann Brain Dominance Instrument, can be applied to provide a practical model for planning. Once some or all of these questions have been answered, identify specific measurable goals and identify when they are to be carried out and achieved. What is most important, though, is to ensure that the question ‘why should I bother to do this?’ is answered, as unless a person can perceive a tangible benefit and see a positive outcome for themselves they are unlikely to feel motivated to follow through. I suspect we can all think of examples of goals we have set but without sufficient emotional will to complete them! Don’t underestimate how useful a practical model can be in helping someone make the journey towards regaining control of their lives. Do try it and share it. As often happens, when i am thinking about a subject, Helen writes about it. What Helen says about dependency reminds me of Lord Farmer’s recent Report on the importance of ensuring that prisoners keep in touch with their families because this helps them do their time – and also it means that they have someone waiting when they leave, to help them readjust to independent living. Today, lunching with women friends, , we decided tha tperhaps it was time that prisons were again thought of as reformatories; punishment time spent in prison might be profitably spent if prisoners were released better able to earn their own living and better able to enjoy their life and their family.